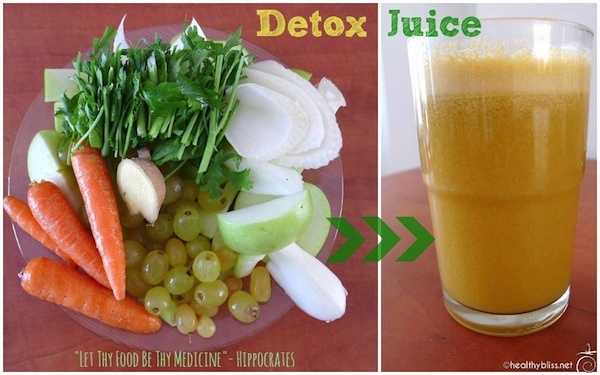 When’s the last time you made a delicious detox juice at home? Yes, it’s time to pull out that juicer and start using it! Each ingredient in this recipe is full of phytonutrients, and that means more health benefits for the body. 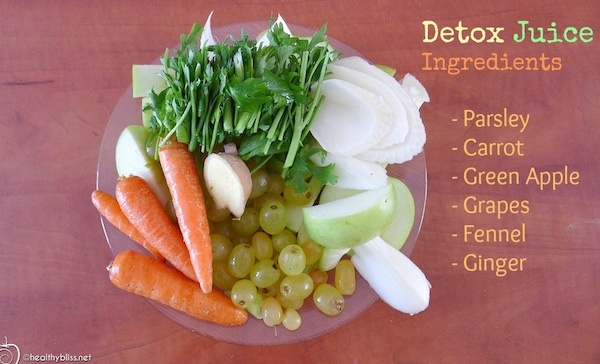 Place All Ingredients in a Juicer for a Healthy Detox Drink! 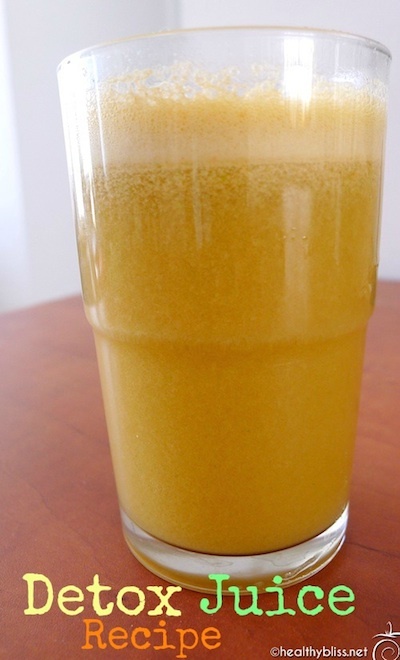 Apples and carrot help to detox the liver. Carrots are also high in beta-carotene, a powerful antioxidant. Grapes have been found to have strong anti-cancer properties due to the anti-inflammatory effect of resveratrol. 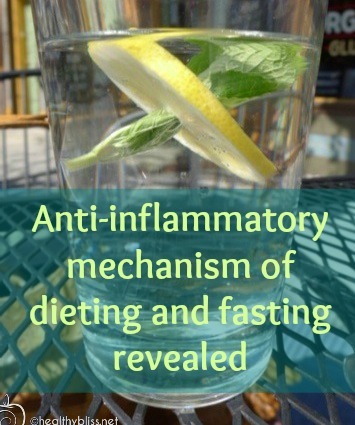 Ginger is a natural anti-inflammatory food and helps strengthen digestion. Parsley helps to cleanse the kidneys and contains folic acid and chlorophyll which can help to regulate blood pressure. The most powerful detox ingredient in this juice is fennel, a simply amazing detox food. Fennel helps to cleanse the colon; it relieves constipation; it’s great for the immune system with its natural anti-parasitic, anti-fungal and anti-viral properties and it’s particularly known to be very alkaline-forming and that means excellent for an alkaline diet and as a natural antacid remedy. When the body heals from the inside-out, the skin clears naturally too! If at all possible, choose organic for your juice ingredients. A Juice has NO fiber and in made in a Juicer. What’s the difference between a juicer and a blender? A juicer separates the fiber from the liquid, and you drink only the juice. 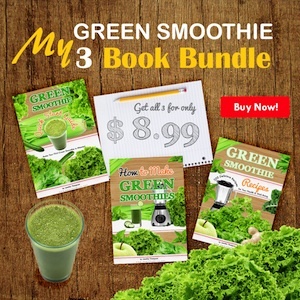 A blender blends all ingredients together and you drink the fiber and the liquid, called a “smoothie.” This recipe is for a juice, but if you don’t have a juicer, you can certainly mix all the ingredients in a blender and make a nice detox Green Smoothie too! Juice is easy to digest and absorb and is particularly good to high-boost your mineral, vitamin and micro-nutrient reserve. Place all Ingredients in a Juicer and Juice. Makes 1 Serving. Drink Immediately. You can also add 1-2 Tbsp. of Raw Apple Cider Vinegar, stir well and drink. Use Variety in Your Juices. Make Different Variations! This is a great juice recipe, all vegan, vegetarian and of course a raw food, but it complements any diet. You can make variations of this recipe by using cucumber instead of carrot or celery instead of apple or kale instead of parsley. Don’t be afraid to try different combinations! More fresh juice packed with fruits and vegetables is always a good thing! Flaxseed (or linseed) is a very small shiny seed with a lot of great health benefits, from reducing cholesterol to improving blood sugar levels for diabetics. The reason why it’s a Superfood is because flax is very high in dietary fiber, it’s a plant-based source of omega 3 fatty acids, and a high source of lignans (phyto-nutrients possessing powerful antioxidant and anti-inflammatory properties). Adequate fiber in the daily diet is key for good digestive health. You can buy flax in a few different ways – in whole seed form, already ground into powder form (ground whole seeds) or as flax seed oil. 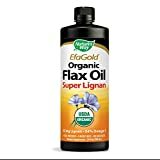 While flax oil does have many health benefits, it is lacking the valuable fiber of the seeds themselves (because the seeds are pressed, separating the fiber from the oil). Whole flax seeds contain both the fiber and oil, giving you all of the nutritional value in one. However, flax seeds need to be ground before eating so the body can absorb their nutrients. If not, they will simply pass through the digestive track in whole form and that means their nutrients will pass through too! 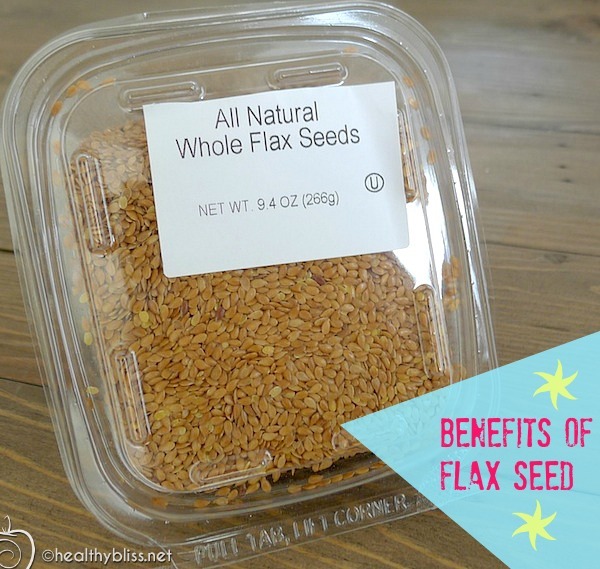 The freshest way to consume your flax seed is to buy the seeds whole and grind them yourself at home. It’s the most inexpensive way to add them to your diet too. Look for organic whole flax seeds in the bulk food section of your local health food store or in your supermarket near the cereal or baking section. You can use either a mini-food processor or coffee bean grinder to grind your flax seed into powder form. Simply add the seeds to the grinder, and grind. You should add the seeds dry and end up with a dry powder. Do not add water to the grinder. Also, be sure that your grinder is clean before you start (clean out any coffee bean residue if using a coffee grinder). 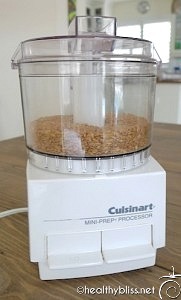 For an inexpensive mini-food processor, check on ebay or at local yard sales (many people sell them as ‘baby food makers’). I usually keep about a 2-4 weeks’ supply of ground flax seed in the refrigerator at any given time; that equates to 2 cups or almost 500ml. Adding whole, unrefined high fiber foods to the diet can help strengthen the digestive system, decrease toxicity in the body, stabilize blood sugar levels, clear the skin and even improve kidney and liver function. It’s a small amount of time and money invested that offers a high return: your health! Whole flax seeds can be stored at room temperature in a container or jar. When the flax seed is open (into a powder or pressed an oil), it becomes temperature-sensitive and will turn rancid if left at room temperature. Once ground, it is important to store your flax seed powder in the refrigerator (and preferably in a glass container). 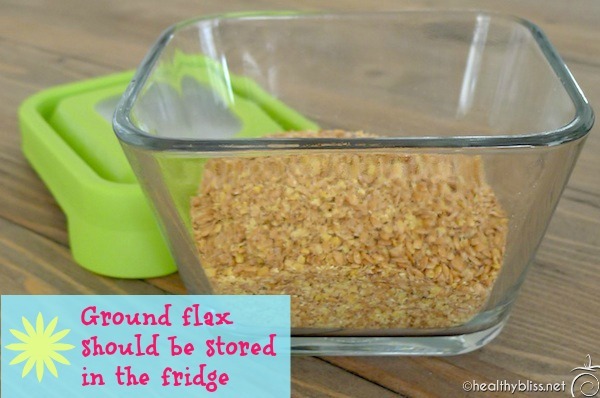 If you are reading this article and have your freshly ground flax seed stored in the cupboard, please do not just move it to the fridge and think that it’s ok. It’s best to throw it away, grind a new batch and store the newly ground flax seed in the fridge. Store-bought ground flax seed should be stored in the fridge after opening. How much ground flax seed should I eat every day? 2 Tbsp. of ground flax seed has almost 4 grams of total dietary fiber. I recommend that you start with adding 2 Tbsp. 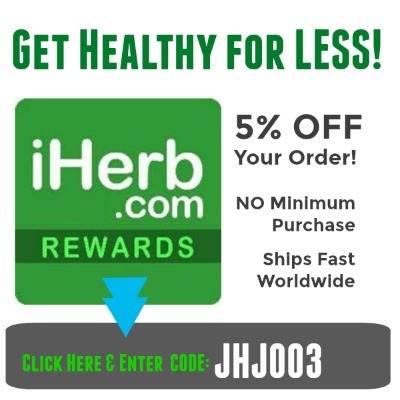 of ground flax seed to your daily diet, and slowly increase to 3-4 Tbsp. per day. Some people consume 6 Tbsp. daily and are very comfortable with their digestion, often finding relief from constipation and other digestive problems just from the simple increase of fiber in their diet. 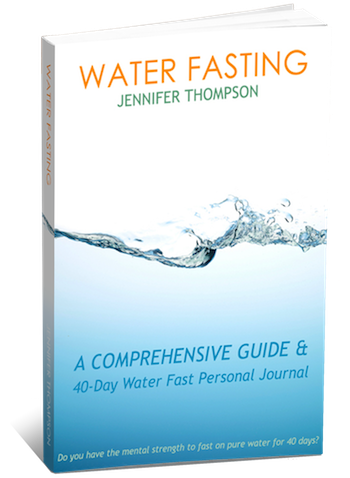 Imagine someone consuming 15 grams of fiber per day who adds 4 Tbsp. of ground flax or 8 grams of fiber to their daily diet: without changing anything else; they are now consuming 23 grams of dietary fiber daily! It’s so easy! What if I buy a package of already ground flax seed? Do I store that in the fridge? You can buy flax seed already ground. Be sure to store it in the fridge immediately upon opening the package. 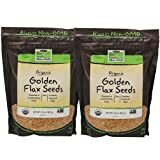 Is it better to buy the light brown or the dark brown flax seeds? 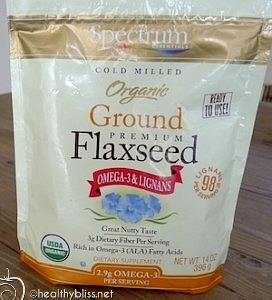 The best type of flax seed to buy is 100% certified organic, of course! I’ve tried both the light (or golden) and dark brown flax seeds, and I do make a conscious effort to add variety into my diet so sometimes I buy the golden brown and sometimes I buy the dark brown. When I’m feeling a bit wild and crazy, I even blend them both together and store the mixture in the fridge! Is it possible to eat too much flax seed? I do think that any one food eaten in too much excess is probably not a good thing. The key to good health is variety and balance in the diet. In this case, if you were eating 10x-20x the normal recommended amount of daily dietary fiber, you may be in store for some serious buffalo-sized poo! As I said before, start with 2 Tbsp. of ground flax seed daily and slowly build up to 3-4 Tbsp. with a maximum of 6 Tbsp. per day. Think nice human-size poo and you should be fine! What about the fat content in flax seed? This question always amazes me. It’s most often asked by my female clients who have been struck with the ‘no-fat’ or ‘low-fat’ mindset. These same women will turn down such a high nutrient-dense food like flax for fear of excess fat, but continue to indulge in a daily latte or afternoon chocolate bar. I am often left very perplexed by this logic!! According to the USDA, 2 Tbsp. of ground flax seed weighs 14 grams, has 75 calories, 5.9 grams of total fat and 3.8 grams of total dietary fiber. While true that ground flax seed does contain fat (5.9 x 9 calories per gram = 53.1 calories of fat per 2 Tbsp./75 calorie serving), it’s important to keep things in perspective. If you’re eating 53 calories of fat in a 1500 calories per day diet, that equates to 3.5% of total calories in fat. Move up to 4 Tbsp. per day and you’re at 7%. Now do the math on your latte and chocolate bar and factor in their nutritional value then re-evaluate who is your friend and who is your foe. The answer: 2-4 Tbsp. of ground flax seed is not a high-fat contribution to your overall dietary intake of food. What about the photo-estrogen in flax seed – is it dangerous? This is another important factor to consider and a question I get asked occasionally. Remember, we are talking about adding 2-4 Tbsp. with a maximum of 6 Tbsp. daily of ground flax seed. Keep in mind too that I am recommending the whole ground flax seed, and not the oil (which would be more concentrated in phyto-estrogens). It is true that flax seed does contain photo-estrogens but there are mixed reports on whether the estrogen from flax seed alone is affecting people’s glandular and hormonal systems. I do believe if you were eating a bucket of flax seed at every meal, this would be an important issue, but we are talking about a few spoonfuls, and the other health benefits of this natural, whole and pure food are major reasons to keep it in the diet. Keeping variety in your diet is the best way to give your body all the important micro-nutrients it needs without over-whelming it with any excess amount of anything. Of course, if you have an estrogen-related health condition or specific medical concerns, it’s best to consult with your medical doctor. Add 2 Tbsp. 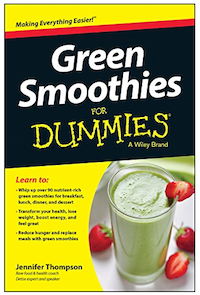 of ground flax seed to your Green Smoothie daily. Sprinkle 1-2 Tbsp. of ground flax seed onto a fresh fruit salad. Mix 1-2 Tbsp. 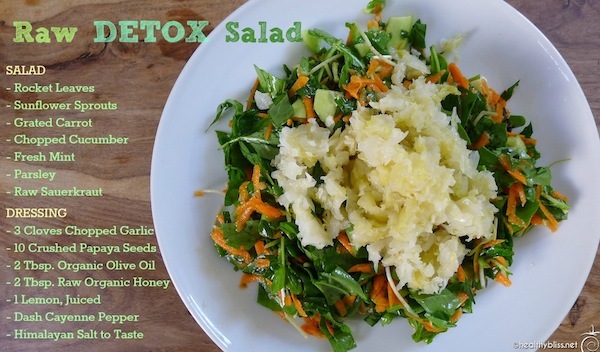 of ground flax seed into a homemade salad dressing or raw food veggie salad.